My favorite time of year is when all the seed catalogs start showing up in my mailbox. It’s a sign that gardening season is almost here. I love pouring over the catalogs with a highlighter in my hand marking things I’d like to try. Honestly, I’d plant everything in the world if I had the space! Every year we set aside space to try new, interesting, and unique vegetables. My kids love, love, love to grow anything weird an unusual, so they are just as excited as I am to circle this year’s selections. Over the years we’ve planted a lot of things- some only once and some have become favorites that we grow year after year. If you are looking for some new and unique vegetables for your garden, here’s a list of some of my favorites! 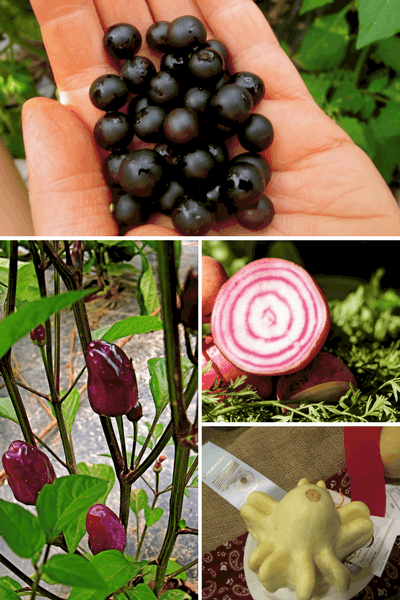 13 Unique Vegetables for Your Garden! The painted serpent cucumber that is also sometimes classified as a melon. It is an Armenian variety with pale, thin skin that doesn’t need peeling. My oldest son chose this variety because of it’s length- they can grow up to 30 inches in length! I find that they are best eaten before they get too large- around 18 inches or so. If you let them keep growing they do start to resemble a melon a bit in both tastes and looks on the inside. Our customers at the farmer’s market LOVED these we sold out every time. And the best part is that they are not only unique but one of the best tasting cucumbers I’ve ever had! The Chinese 5 color is a variety of hot pepper that grows all 5 different colors on the same plant. The peppers are small- about 2 inches tops- and start off a light purple. If you leave them on the plant they will get change colors from purple to cream to yellow to orange and finally to red. This is a beautiful plant, and one that could do well as an ornamental edible hidden in a flower garden. Another unique thing about this vegetable is that the hotness of the pepper increases with each color change. If you want a mild hot pepper, pick them when they are purple or cream. If you like more heat wait until the peppers turn red. This variety is prolific, hearty, and will produce all season long. I chose this variety for its unique look but I continue to grow it every year because it is just so good to eat! Dragon Tongue beans are bush beans that grown on compact plants. They are beautiful to look at with their yellow-green pods and purple streaks. The plants are prolific and I have zero problems with pests. These beans are another market favorite- customers absolutely love them! They are wider than your standard green bean, and are actually a kind of wax bean. The pods are 6-8 inches in length and can be harvested early or left on the vine for dry beans. Peas are one of my favorite things to grow- and I never seem to be able to grow enough of them! When I saw purple podded peas in the catalog- buying them was a no brainer. They are beautiful from flower to pod. There are a couple different varieties of purple heirloom peas- some are pinker, some more blue. Either way, I love them! These are not snow peas, but should be shelled. We pick all of our peas early when they are smaller and sweeter. I am not a huge beet fan, the first beets I ever grew were for the sole purpose of making a natural red food dye. But the Chioggia Beet is lovely. It is beautiful with red and white striped flesh inside. The taste is mild and sweet and not as earthy tasting as some other varieties. This is another that does quite well at a market. This is a french variety of scalloped squash. Once again, my oldest son originally chose it because it can get quite large. And with its stripes and warts it is quite a unique vegetable! They kind of a mix between a winter and summer squash, If you harvest them young you can use them like other summer scallops- their size makes them good for stuffing! If you leave them on the vine they will become more colorful and hard. They are nice for fall decoration when they are left on the vine to ripen fully! We are always looking for new fruits to grow here at home- especially ones that can grow quickly and be preserved for later. Wonderberries are annual plants that are in the nightshade family. They grow small, bluish berries in clusters all season long. My kids love to eat them straight off the vine. We pick a ton each year and can freeze them easily for later use. Our favorite uses are wonderberry jam and using wonderberries in place of blueberries in muffins. If you are looking for a good lima these are wonderful. They are large white, flat beans with dark red mottling on them. They grow well all season long, even in hot temperatures. They definitely need something to grow up- we planted them after our peas and they grew up the 5 foot fence and across to the next row and back down! We had a jungle tunnel of beans that first year! Harvest them once they pods have tried and make sure the beans are fully dry before storing them in an air tight container.